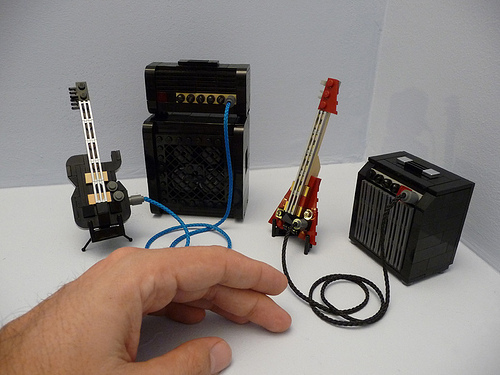 These guitars by LEGOWOW have enough detail to look almost exactly like the real thing, but they’re still small enough to be awesomely adorable. Thanks to Bruce for the tip! This is pretty awesome. My first couple seconds made me think I was seeing a tiny model set or something. When I called my thirteen year old in to look, he had the same experience. Man, those Guitars are pretty cool, but the amps and the stack are the BOMB. Are the Quarter Inchers even LEGO? It’s great but no way is that a Telecaster. More of a Les Paul IMO. The guitar necks should probably be a bit longer. But the amps are incredible! These are beautiful! The rig on the left looks just like a VOX set-up. And that guitar could totally pass for a Tele…thought if the head were tan instead of black it would be more authentic. Part #2452 is available in tan!